As Atlanta grows and becomes more diverse, the demand for international selection of groceries increases. Not only do our residents want more diverse options but also fresher. This is where City Farmer’s Market comes in. We offer a wide selection of farm fresh produce, meats and live seafood along with various specialty items not widely available in national chains. “Fresher than Fresh” is our slogan because we strive to provide you with the freshest foods possible, that is our mission and promise. Our produce is sourced from local farmers and all over to ensure the highest quality products. Without warehousing and distribution delays, your food should be from local farms to table with the least amount of interference. Our “Fresher than fresh” foods, large international and specialty selections are matched with superb customer service for a shopping experience you will love. So what are you waiting for? Come and shop with us at a local City Farmer’s Market near you! We are located in six convenient locations to serve our local communities in Atlanta, Chamblee, Duluth, Marietta, Norcross and Snellville. Check back with our website for weekly deals in your specific CFM location or browse through all six stores for more. Get inspired by looking through our updated recipes and you can even submit your own recipe to be featured on our website! Email us under our “Contact Us” link with your recipe and photos of your food for a chance to be featured. For more inspiration, click through different Best Sellers in different food categories for ideas under the “Shop” tab. You can also now leave reviews for items you like or did not to help out other shoppers too. 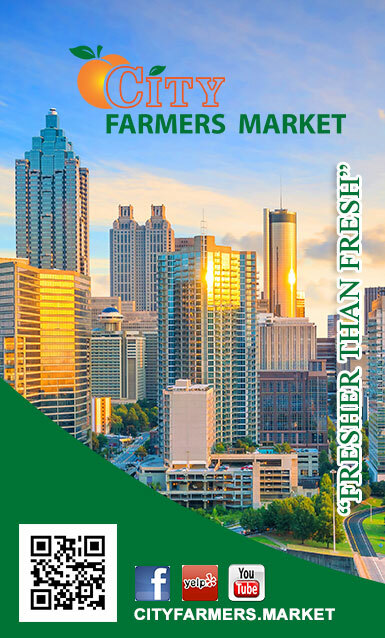 Don’t settle for less when City Farmer’s Markets are always fresher than fresh!